Sigra manufactures a range of inflatable borehole packers to suit specific requirements. 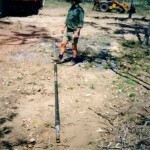 Sigra has constructed packers for borehole diameters ranging from 50 to 305 mm. Because the requirements for packer applications vary, Sigra does not generally maintain a stock of packers. It manufactures a suitable device to meet a client’s specific requirements. Sigra designs and manufactures borehole packers and seals. 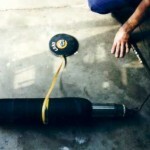 These may be inflatable or compressively expanded devices. Sigra can manufacture packers from 20 mm diameter to 3.2 m in diameter. The latter can be used to seal tunnels. It has manufactured packers for grouting, pressure testing, Sigra’s own DST tools, hydrofracture and casing repair systems. Examples of Sigra’s packers are shown in P13 which shows a packer under test. 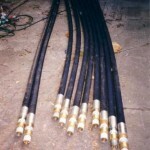 Photo 14 shows flexible infusion packers for injecting water into coal seams to control dust. These packers are flexible so that they can be inserted from narrow roadways. Photo P15 shows packers on Sigra’s free fall DST tool. Sigra will build packers and packer systems to order. However special one-off designs are likely to carry a design cost. To assist Sigra in determining the client’s requirements a packer specification sheet is attached. Could potential clients please print this, answer the questions and fax the sheet to Sigra at +61 7 3216 6988. Sigra staff will then be in a better position to determine the packer design that best suits the need.